I have been quite fortunate with my employer when it comes to wearing the right shoes. I work in an office and, despite the stereotypical dress-code rules, they have been quite accommodating with me needing to wear something more supporting than a shiny, black leather loafer. I have spent many years wearing slip-on leather shoes to work which I found more comfortable than those with laces (and the laces in office shoes just seem to break all the time for me which I hate!) but over time, they were “giving” at the sides and are not very supportive to my feet at all. Many people who work jobs such as waitressing, where they are on their feet most of the time will benefit from wearing the right shoes. If you are in this sort of job and have heel pain too, unless you get the right footwear to prevent plantar fasciitis, your feet are just not going to get better. 1. They were more rigid in the mid-sole area. This is a design which is recommended for people suffering with Plantar Fasciitis. It provides more support in the area where the plant fascia is, helping to avoid any over-stretching or bruising. 2. They need to provide good foot and heel support. Having good heel support will stop your feet from pronating (rolling to one side or the other) which in turn, places additional strain on your feet. One of the main causes of foot pain is from your posture or gait, where you are not walking properly, putting stress on parts of your feet that are not designed to carry so much weight. You might think that a shoe for Plantar Fasciitis sufferers might be softer around the arch in your foot and near to your heel, where most PF pain comes – but ideally, it needs to be more rigid and fixed, not allowing your foot and ankle to move, roll or bend in the wrong way. A great example of this type of design in action, is for running shoes, which come in different types depending on how you run. If you go to a proper running shop or sports store, you can try running shoes on and have the assistant film you running on a treadmill. From this, they can see where you might be placing your foot incorrectly, or where the shoes you are wearing are allowing your ankles to roll to the sides slightly. This is called under or over pronating. For example, when I bought some running shoes, I was identified as an overpronator and had to opt for the shoes with the firmest support, which stopped my ankle from bending outwards when I landed. The same applies for normal shoes too. Without the additional support, you could be causing additional stress to the muscles in your feet – not a good thing! 3. They were Orthotic compatible. I needed some shoes that were wide enough and had enough room to allow me to also use my orthotics. They also had to have removable insoles as having both the orthotic and the insole in at the same time is not a good idea. Getting orthotics can be a bit of a chicken-and-egg type scenario. Not all orthotics will fit every type of shoe and you will ideally need to take your shoes with you when you have your feet measured for orthotics. However, you need to buy shoes that are right for your orthotics and have enough room for them to be used. It’s hard to work out which comes first. You can read more about buying orthotics for treating heel pain and why they are good for your feet. 4. They were a dark color and “office friendly”. I am a firm believer that “the clothes do not make the man”. The fact that I am not wearing a shirt and tie, does not mean I am not able to perform my job. However, there are certain rules and established standards that we must all agree to when working in an office and wearing appropriate shoes is one of them. However, there is someone in my office who wears the brightest trainers he can find and somehow manages to get away with it (also whilst meeting with customers and clients too). He also has a “foot problem” that requires him to wear them – but I am not sure what it is. However, I am not as extroverted as he is, so I needed a shoe that would not look too obvious. When I was looking for a pair of plantar fasciitis office shoes, it was important that they were nothing too fancy, ideally as dark colored as possible. In the end, I decided to go with a company called Merrell, who are more well known for making hiking boots for men and women, although they also make running shoes, sandals and shoes too. 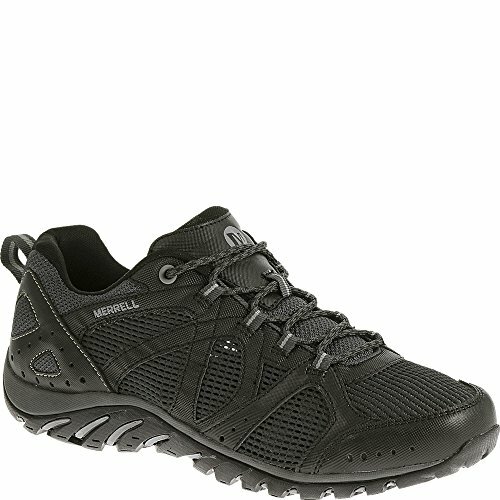 The good thing about Merrell, is that they are quite common in the stores, so you get to try them on, but they are also not too expensive. They also come in fairly muted color schemes, which fits the requirement to be suitable for the office. As you can see, the design is quite conservative when it comes to the colouring and the support for the heel is excellent. The Merrell Rockbit is made for walking and hiking and therefore it has a very sturdy sole, which allows for great support under my foot, which is where I need it most when my PF flares up. I had also purchased the Rockbit shoes already, before I went to have my orthotics made and I can remember the podiatrist asking if the type of shoes I was wearing (the Merrell’s) were going to be my regular shoe as it would make a difference to the type of product she would order for me. If those Merrell shoes don’t quite fit the bill for you, take a look at this selection of the top selling shoes that have been designed for people who have Plantar Fasciitis and that fit my criteria. Anything from Orthaheel is probably a good buy when it comes to shoes that are designed for people with problem feet. The company was started by a Podiatrist, so you know that what you are buying will be a good fit with your needs. 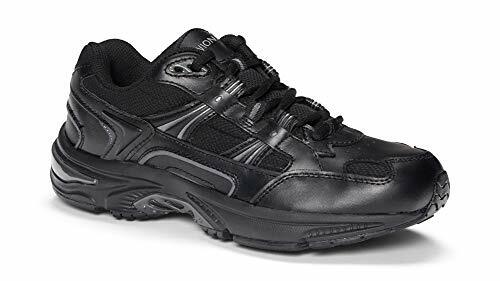 The Orthaheel Walker is a leather walking shoe, so is designed to reduce shock to the foot and ankle, whilst also being supportive too. There is also a men’s “dress shoe” that would be perfect for the office, that features the same Orthaheel technology. They not only look the part, but are also designed to help people with various foot and ankle problems too. Most running shoes will be ideal for wearing at work as they are designed to support and protect your feet and ankles, are non-slip and are great for feet. However, you might not be able to find some that are not supplied in glow-in-the-dark bright colors. Again, it is important to buy a pair that allows you to comfortably wear a pair of orthotics inside, which will give your foot additional support. If you are not using a doctor or podiatrist supplied orthotic, many stores where you can buy running shoes will be able to provide you with a custom made insole for the shoe. These insoles are heated and fitted to your foot, matching the contours of your sole and toes, giving you additional comfort and support. This, combined with a pair of running shoes that are dark in color and provide good support to your mid-sole and ankle, will be great for wearing at work. If you are working a job that requires you to wear a more study type of footwear, such as a workman boot, then your options are more varied as you will be able to choose from hiking type boots, without worrying too much about them coming in colors that are not acceptable. Most work boots will be very sturdy and designed to be strong and protective, but this often means that they have concentrated on manufacturing a better outer layer, than an inner one. You will definitely need to look into using an orthotic to give you that extra support when working. 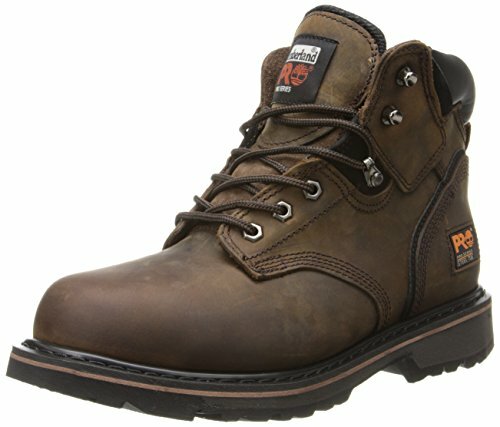 A boot like the Timberland Pro Pitboss, which is the best selling work boot on Amazon at the time of writing this article, looks like it could withstand anything and could easily work with an insole designed to give your foot more support. How to avoid foot pain at work. Throughout your working day you may be sat at a desk, stood at a counter or doing a task that requires you to constantly be on the move. No matter what your job may be, foot problems are common in all sectors. Although we all want to look stylish and fashionable to impress our colleagues and keep that business-like appearance, foot pain through incorrect footwear can lead to a number of short and long term injuries. Not only does it damage the foot, but it affects the stability of the ankle and can lead to long term back and neck pain, seriously impacting not only how you do your job, but also your ability to move around easily. So not matter what your job may require you to do each day, there are a number of things you can do to help ensure you keep all foot pain to a minimum. Especially in the office, pumps and high-heeled shoes are a common accessory to accompany any fashionable workwear outfit. However, wearing high-heels can cause a number of issues. Many of these shoes are very tight meaning although they may look good, they are essentially crushing your foot into a smaller space than it is meant to go. Over time this can lead to a lot of pain and a possible slight deformity in your foot. Furthermore, the fact that the surface area of your shoe actually on the ground is much less than flat-heeled shoes, greatly increases the chances of a trip or fall. This can not only lead to a damaged foot, but also a damaged, ankle and possibly worse depending how and where you have fallen. Wearing a flat-heeled shoe may not be as fashionable as you like, but it is important to be as practical as possible in order to keep you safe. If you work in a factory, industrial area or somewhere where there is a lot of lifting and moving around, having protective footwear is an absolute necessity. Generally this involves wear steel-toe boots or other footwear to help protect you from damaging your foot or breaking any bones should you accidentally drop any products or materials on to it. Although these may cost a little more to purchase than regular shoes you might wear to work, the added protection they provide will prove to be money well spent should you accidentally drop anything on to your foot. No matter where you are working, you need to have a good grip on your footwear, allowing you to move around in the comfort of knowing that you won’t trip or fall over due to not having any grip on the surface. Depending on where you work is going to dictate the amount of grip you are going to need. If you are working in an office that has a carpeted floor, you will need some grip but not as much as others, as the carpet itself will help provide grip. However, if you work in an office with an open wooden or concrete floor, you are going to need plenty of grip as there will be none from the floor itself. Also, take extra care when leaving the office on the evening. If the weather is bad or the cleaners are in tidying up, you may find that some of the surfaces are wetter than usual, making them potential hazards for a trip or fall. If you work in an industrial area or factory, having plenty of grip is an absolute must no matter what the surface may be. Working in an area that has a lot of heavy machinery or products makes a stumble or fall lift threatening. One slip or trip while close to the machinery or carrying a heavy load could cost you more than a foot injury. Particularly if you have just purchased some new footwear, you may find that the shoes you are wearing cause a bit of discomfort either pressing against your feet, or a certain part of the shoe digging into your foot. Leaving this as it is can not only cause marking and cuts to your feet, but could also cause further issues down the line. Wearing thick socks can help alleviate some of the pain as it provides more of a protective cushion between your foot and the shoe. Although it may make the fit in your shoe a little tighter, it will greatly reduce the pain and damage on your foot the shoe is causing. Also, if it is a new shoe, wearing thick socks will help you stretch out the shoe, making it much more comfortable for you to wear. If you are someone working in an industrial environment, you should look to wear rigger boots as your workwear footwear as not only are they steel-toed, they provide good grip and have strong support for your foot and lower ankle. I hope that you have found this article helpful, although I know that my choice of work shoes are probably not to everyone’s taste. I only have 2 pairs of shoes (typical man.. I know) – ones for work and ones for play. Having a pair that will be suitable for work and also for walking long distances or going out for a meal in, is important for me and the Merrell shoes I chose are perfect for that. Do you have to wear special shoes for work and are struggling with choosing the right ones to help with your plantar fasciitis?